The list of usual suspects for heavy metals are aluminum, arsenic, cadmium, mercury and lead. These can be found in the environment, hay, supplements, water and soil. As the toxicity of the sources grow, so does the potential of accumulation in the body. The symptoms can range from lack of focus in training, liver pain and dysfunction, hoof problems, rough dry coat, hair loss, muscle weakness, stiff gait, and skin conditions. A time to think about heavy metals is when you’ve hit a stalemate. You’ve done all of the veterinarian recommended tests such as blood work, physical tests and exams. We also typically have expectations from what normally works with our therapy equipment. Gathering more history of heavy metal exposure may be needed along with routine blood work, hair analysis, or urine tests for additional input. Additionally drugs can also show up in tests, though might not show unless hair analysis is used. Drugs used by the racing industry have been found in equine hair. A horse a hair analysis can find substances from chronic feed contamination that include arsenic, atropine, caffeine, morphine, theobromine and many others. Hair analysis can help determine if the drug usage was limited or long term exposure. In a French study anabolic steroids stanozolol and boldenone (derived from male testosterone) were found in hair samples when compared to untreated horses. According to Mark Dunnett Ph.d, he found that antibiotics suphonamides, trimethoprim and metronidazole could be found in mane and tail hair for up to two years if used systemically. The supplement industry can also be a contribution to heavy metals. For example, arsenic is naturally found in rice bran, soy, flax seed and meal and are common binders used in many equine supplements. There are a multitude of supplements for detoxification of heavy metals with lots of variances in ingredients to choose from. Below is chart of individual ingredients listed in detox formulas for horses. Suggestions to help in preparations of a dextox are apples, apple cider vinegar, bananas, carrots and distilled or purified water. Can we detox using therapy equipment? In evidence based medicine, kidney dialysis is used to detox people and to a lesser degree the use of chelation therapy. 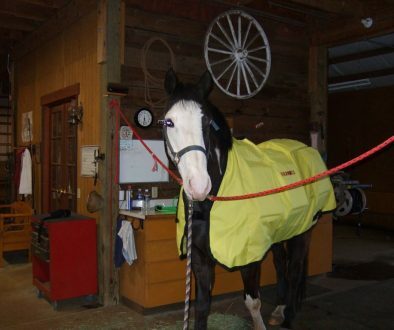 Claims from the types of horse therapies are PEMF, MicroCurrent, Light etc are less proven. It’s more about helping improve the functions that do the work; the kidneys, liver, gastrointestinal tract, lymph, and immune system. patients recover from toxic loads. One human practitioner with a 25 year history of color therapy works with patients that have exhausted main stream treatments and still remain ill. These patients get a diagnosis from practitioners using a variety of methods that determine heavy metals as a possible underlying cause to their ills and are referred to her. Approximately five sessions of infrared, blue, and red light with Nosier frequency sets followed by infrared sauna. She said some of them are on homeopathic remedies and consume Cilantro. She says the recovery rate is remarkable for many of her patients. To potentially help detox our horses with this formula we can use devices with specific features. The infrared heated Thermotex blanket can be the infrared sauna. The Rainbow Meridian LED/Laser has the infrared, red, blue, and Nosier frequency sets in one of the 10 programs. And of course microcurrent has always been a all around tool to help boost the immune system and flush the kidneys (We all know how much microcurrent therapy encourages horses to drink). Please share the results of your test prior and then proceed with any of these suggestions or have a program that you have documented.